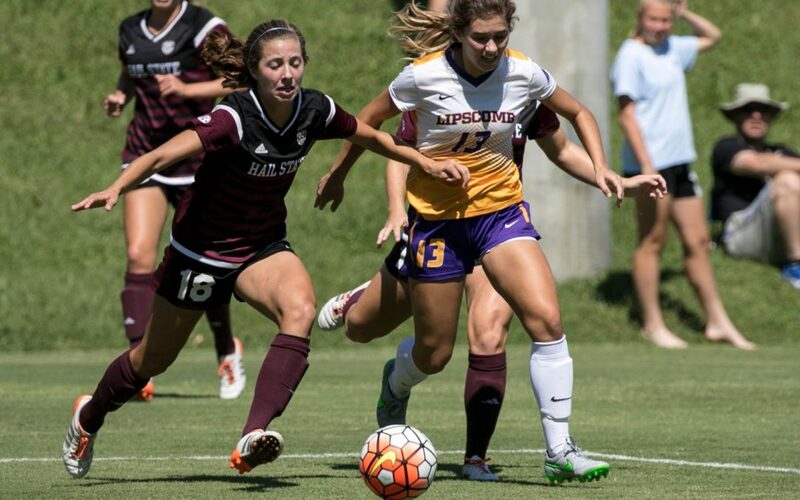 It took dealing with a slippery pitch, firing 18 shots and battling through an overtime period, but the Lipscomb women’s soccer team refused to be denied a home win Sunday afternoon. Forward Olivia Doak fed a pass to teammate Maycie McKay, who slid the ball past Miami Ohio goalie Patricia Koutoulas to give the Lady Bisons a 3-2 overtime victory. The shot was McKay’s only attempt of the day, but it was all she needed to score her first goal of the season at the most opportune time. Miami (2-3-1) took the initial lead on tally from freshman Lyda Bogadanovtich in the 40th minute, but Lipscomb’s Selah Gilmore answered with a goal of her own just three minutes later. In the second half, Lipscomb defender Logan McFadden finished a header from Doak to give the Bisons a 2-1 lead. The goal was McFadden’s second of her freshman campaign. But Miami made things difficult in the 81st minute. Redhawk midfielder Lauren Albrecht knotted the score at two with a rocket from the top of the box to force extra time. Lipscomb (4-2-2) dominated possession in the first overtime period, and Doak and Gilmore each had scoring chances before McKay’s decisive finish. Lipscomb Soccer Complex dodged showers throughout the day, although light rain fell throughout the second half. McKay said the Bisons adjusted their style of play and weren’t overly bothered by the slippery conditions late in the game. Sophomore midfielder Kaitlin Echols suffered a head injury in the 12th minute and did not return to the game. O’Brien said Echols had several stitches and went through concussion protocol, but he hopes she will be healthy next week. Lipscomb hits the road to take on Cincinnati (3-3-1) Thursday evening, before returning to Nashville to host Kentucky (4-4) next Sunday at 6 p.m.
“It’s a really difficult weekend for us, but going into conference (play), we’ve got to test ourselves against the highest level we can because our conference is getting better and better,” O’Brien said.